we are the experts to trust! As certified, degreed applied animal behaviorists, we bring the power of the latest scientific information to help you understand and change your pet’s behavior. 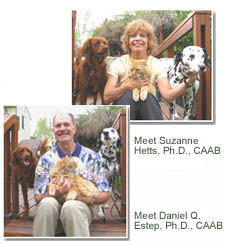 Read our Blog, where Certified Applied Animal Behaviorists SPEAK! So better behaved pets live happier lives with satisfied pet owners! Pet Professionals: Discover how you can expand your scientific knowledge about pet behavior and provide better behavior care and services by joining our subscription site that is full of educational opportunities and client resources. Find out about our Behavior Education Network right now. Click Here to see what BEN has for you. Please visit our companion sites HelpingFido.com and HelpingKitty.com and explore the professional education available through our Telecourses. Receive expert education and information based on the sciences of animal behavior and learning. Prevent, Manage, and Resolve problems such as housesoiling, separation anxiety, aggression, barking, destructiveness and more that regular training does not address. Understand and correct cat behavior issues by re-discovering the unique nature of cats from a scientific perspective, which is different from popular myths about cats. Anyone can call themselves a "behaviorist" - but our graduate degrees in animal behavior, years of practical experience and professional certification ensure that the education and information we provide is the highest quality, and not what we've come to call "Behavior Baloney" - information disconnected from science and critical thinking.